As part of my session on The Economy and Economic Regeneration Strategies in the permaculture design course at CERES Community Environment Park, we spend some time teasing out what an economy is and what its structural features are. Developing an understanding of how the economy mediates our relationships between our environment and each other, is integral to putting the three permaculture ethics—Earth care, people care, and fair share—into practice. For most people, the discussion of the economy in popular media is shrouded in an impenetrable wall of complex jargon and ideological coding. Our first step toward pulling away this shroud is the explore our experience of the economic system and then trace our lived experience back through the structure of the economy and the systems of power behind it. Jumping into academic discourses on the economy is not necessarily the best approach as a first step for this journey, however there are other entry points. In this activity, which I deliver as part of Unit #36 from the Syllabus for Permaculture Design in South Eastern Australia (compiled by Graeme George for the Victorian Permaculture Educators Guild), participants are asked to visualise their connection with the economy through the medium of free drawing. First, the group brainstorms definitions and features of the economy, which we collate on a whiteboard. Next, we explore the groups responses in relation to the six elements of the economy illustrated in the diagram below. 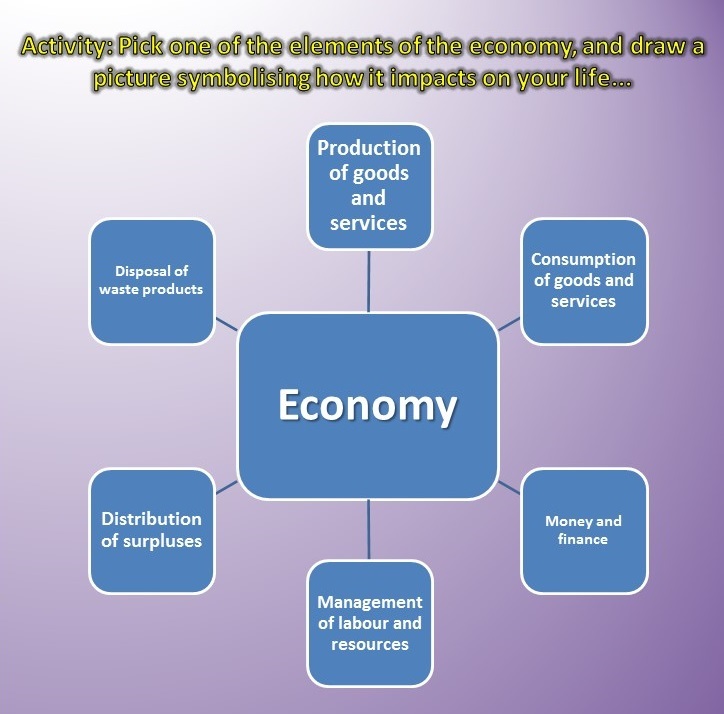 Finally, participants were then asked to visualise their connection to one of these elements of the economy in pictorial form by drawing a diagram. As a group we then viewed the collected drawings together to decode meaning, identify patterns and interpret our connections to the economy. Some of the drawings created by participants are show below. I encourage you, the reader, to try to interpret each drawing and place which element of the economy it relates to. In so doing, reflect on how you are connected with the economy and how it impacts on you. This is a key step in the social permaculture journey. The drawing-based workshop activity is an adaptation from a more expansive research methodology developed by my PhD student Sarah Houseman, who is exploring ecological and horizontal organisational models in her research project. The aim of this method is to provide participants with a tactile means of communicating connections, as well as an means of articulating potentially problematic relationships in a non-confrontational manner. The visual medium can also help the researcher identify patterns across the data set that might not otherwise be obvious from written or spoken responses. Thank you to all the participants in the PDC #25 group at CERES for your enthusiastic participation and thoughtful contributions to this activity. Thanks also to Monique Miller, Donna Livermore, Martijn van der Kamp, and Kate Pospisil for their input into the social permaculture units of the CERES PDC. The social permaculture units are also inpsired by the work of Looby MacNamara, Robin Clayfield, Starhawk, Rosemary Morrow, Robina McCurdy, David Holmgren, Dave Jacke, Dan Palmer, and Rob Czernik., along with the many wonderful permaculture practitioners I have interviewed and spoken at International and Australasian convergences. Beinhocker, Eric. The Origin of Wealth: The Radical Remaking of Economics and What It Means for Business and Society. Boston: Harvard Business School Press, 2007. Brown, James H., William R. Burnside, Ana D. Davidson, John R. Delong, William C. Dunn, Marcus J. Hamilton, Norman Mercado-Silva, et al. “Energetic Limits to Economic Growth.” BioScience 61, no. 6 (2011): 19-26. Dawson, Jonathan, Helena Norberg-Hodge, and Ross Jackson, eds. Gaian Economics: Living Well within Planetary Limits. East Meon: Permanent Publications, 2010. Eisenstein, Charles. 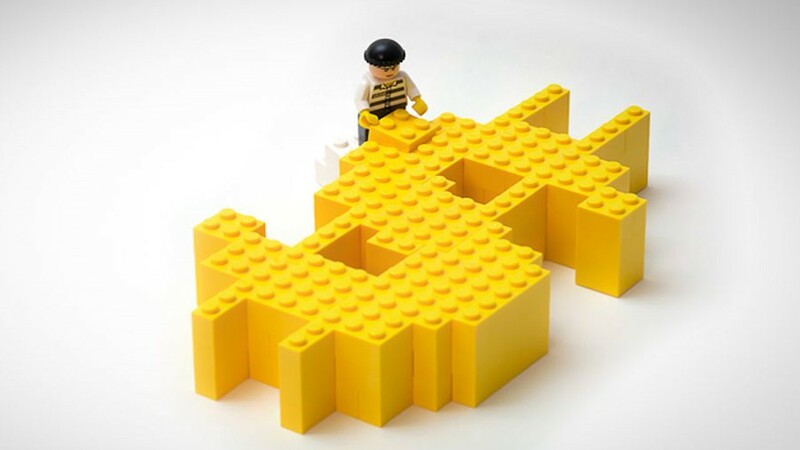 Sacred Economics: Money, Gift and Society in the Age of Transition. Berkeley: Evolver Editions. Ferguson, Rafter Sass. “Toward 21st Century Permaculture: Critical Questions and Early Answers.” Permaculture Activist 93 (2014): 1-11. Grayson, Russ. In the Anthropocene…What Role for Permaculture? Sydney: Pacific Edge, 2015. http://pacific-edge.info/2015/03/in-the-anthropocene-what-role-for-permaculture/. Habib, Benjamin. “Sustainability Is Not Enough: A Call for Regeneration.” Ethos 23, no. 2 (2015): 7-10. Heckert, Jamie Vishwam. “Planning for Abundance: Permaculture and Radical Transformation.” Theory in Action 7, no. 4 (2014): 97-106. Hemenway, Toby. “Permaculture: The Design Arm of a Paradigm Shift.” Resilience, http://www.resilience.org/stories/2015-04-18/permaculture-the-design-arm-of-a-paradigm-shift. Jackson, Tim. Prosperity without Growth: Economics for a Finite Planet. London: Earthscan, 2011. Ku, Do-Wan. “The Emergence of Ecological Alternative Movement in Korea.” Korean Social Science Journal XXXVI, no. 2 (2009): 35-66. Macnamara, Looby. People and Permaculture: Caring and Designing for Ourselves, Each Other and the Planet. East Meon: Permanent Publications, 2012. Pyhälä, Aili. “In Search of Global Sustainability and Justice: How Permaculture Can Contribute to Development Policy.” In Environmental Anthropology Engaging Ecotopia: Bioregionalism, Permaculture, and Ecovillages, edited by Joshua Lockyer and James R. Veteto, 195-212. New York and Oxford: Berghahn, 2013. Roland, Ethan C. “Eight Forms of Capital.” Permaculture Magazine 68 (2011): 58-61. Seyfang, Gill. “Growing Sustainable Consumption Communities: The Case of Local Organic Food Networks.” International Journal of Sociology and Social Policy 27, no. 3/4 (2007): 120-34. Thornton, Tim. “The ‘Complexity Revolution’ Seen from a Historical and Heterodox Perspective.” In Reclaiming Pluralism in Economics: Essays in Honour of John E. King, edited by Jerry Courvisanos, James Doughney and Alex Millmow, 238-50. Abingdon: Routledge, 2016. Wojtkowski, Paul A. Agroecological Economics: Sustainability and Biodiversity. Burlington: Elsevier Science, 2010.